A Bach piece usually comes to us without much (from the composer at least) in the way of direction, an omission which is unfortunately taken all too literally in many performances. Most likely a bit of interpretive latitude was permitted, though it is just as easy to find romantic, even overwrought playing of the same pieces. The question of how much freedom we may take while respecting Bach's intent - or our perception of it - is one we musicians have been grappeling with ever since his era passed into history. If an audience is genuinely moved by hearing someone play a Bach piece, it is a "good" performance. A performer's interpretation, and the audience's acceptance of it, will be determined by, among other things, the time and place of its creation. Thus, what we might hear as "overwrought" playing might have been perfectly acceptible for turn-of-the 20th century audiences, while a heavy-metal guitar shredder, playing a fast, high-volume, effects-drenched, but otherwise robotic version of, say, the Chromatic Fantasy may well inspire a crowd of headbangers in a present day arena. Let us however take the position that there is a "best" place from which to start, and that this is a vantage point as close as possible to that of J. S. Bach himself. How close can we hope to come to what he had in mind? It is less of a stretch to see it as horizontalized choral writing, which even conforms to various voice-leading rules, though this gets us no closer to an idea of how to perform it. An alternative approach is to return to Szeryng's "contrapuntal and rhythmic mishmash" and see if we can impose some kind of order, based upon the unambiguous direction Bach gives at the beginning of the piece: the word courante. It is likely that Bach, when writing a courante, assumed that anybody playing it would likely know what that meant, that this one word would activate for the performer a host of associations in much the same way someone today beginning a piece in triple meter with the notation "jazz waltz" would consider that sufficient. Therefore, an investigation into the nature of that dance (though we know his "dance movements" were not written for dancers) should give us a context, however murky, from which to proceed. By the time Bach wrote the Bm Partita, the courante had been in existence in one form or another for at least a century and a half, so it's difficult to know what the term specifically meant to him. Dolmetsch states "The courant, or coranto, as its name implies was very rapid about 1600. It had become much slower about 1700." (45) Johann Joachim Quantz, who during a time of changing styles remained a member "of Bach's school" (Dolmetsch, 62), in his treatise versuch einer Anwiesung die Flöte traversiere zu spielen (1752) declared the ideal courant tempo to be quarter note = 80. We also know that it was originally a pantomimic dance in which three couples played out a scenario of seduction, rejection, and eventually, after some pleading on the part of the gents, acceptance (Sachs, 361ff). Perhaps this seductive, even tender emotional quality, and rather stately tempo could be allowed to inform a contemporary performance of the Bm courante. If we assume that this could have at least been a subconscious part of Bach's sense of the courante and apply it to the piece at hand, we may see a different way that the notes of a given measure relate to one another. Now the implied "voices" take on a new function as rhythmic indicators. 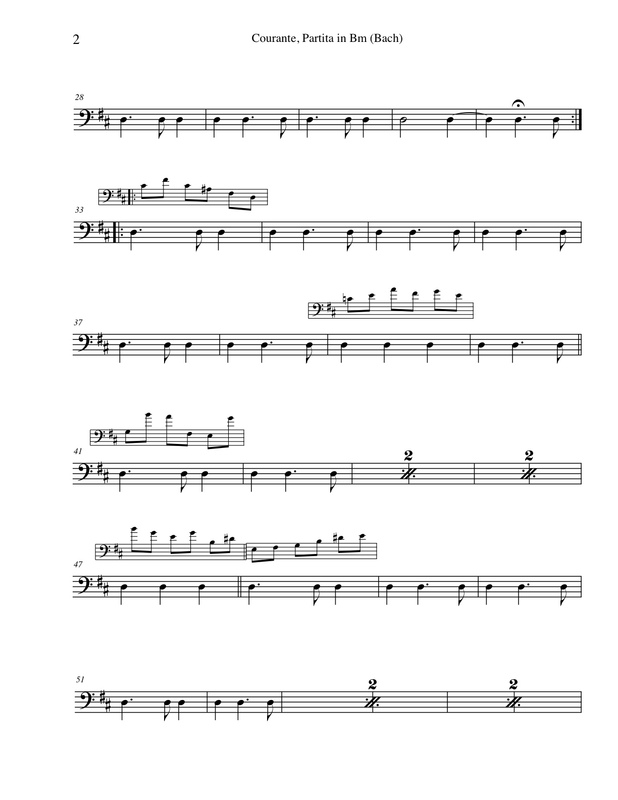 It may be tempting to compare the courant pattern to the clave of Afro-Cuban music. However, the alternation of measures - the two "sides" of the clave pattern - in the latter is strictly adhered to, while Bach's relative freedom in alternating or repeating the two "sides" also relates notes within a measure, one measure to others, builds phrases, regulates tension within phrases, and syncopates the call-and-response rhyming of the two sides of the pattern. 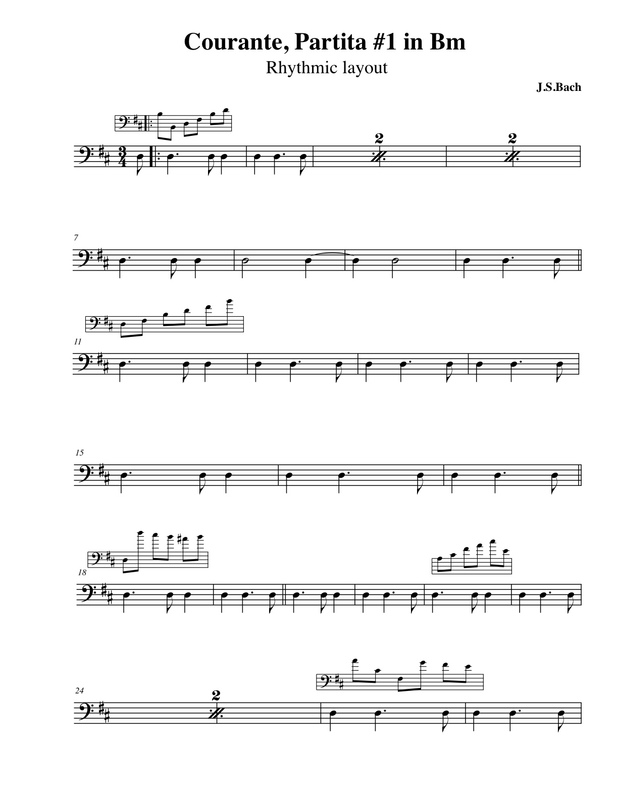 The following is my admittedly subjective idea of a "rhythmic map" of the entire piece. You must not separate ideas which belong to each other, and, on the contrary, you must divide them when the musical sense is finished, whether there be a pause or not. The first six bars display three regular occurances of the rhythmic pattern, but Bach also finds various ways of prolonging a pattern. The fourth pattern extends over four bars (m7 - 10), with a two-bar hemiola inserted between the two measures. Bars 11 - 14 and 15 - 17 may be seen as only two patterns, with the second side being played three and two times respectively. Hemiola crops up again in the last two bars of the first section as a closing gesture (which is often employed in triple meter pieces). The player must try to feel in himself not only the principal passion but all the others as they come. And as in most pieces there is a perpetual change of passions, the player must be able to judge which feeling is in each thought, and to regulate his execution upon that. The more harmonically and rhythmically active second section can also be seen as a set of "thoughts," with the harmonic and tonal movement confirming the clues we get from the rhythm. Measure 48 marks the beginning of one of those "changes of passion:" twelve relatively sunny bars in D-major, whose new mood is reinforced by a more regular repetition of the rhythmic motif. The end of the passage is marked unequivocally by the two-measure hemiola gesture at mm 58-59. While bar 60 serves as a transition back to the B-minor sonority and the prevailing darker emotional color. Whether unequal eighths are expected in a Baroque courante however, is open to debate. Some of the criteria are met, though sources are somewhat unclear (to this reader) about its application in triple meter. Experimenting with unequal eighths (the term "swing eighths," while convenient shorthand, calls up an inaccurate association with Swing) in the case of the Bm courante had the surprising effect of seeming to flatten out the rhythmic play discussed above. Therefore it seemed best to stay with even eighths, per current practice. seems to have the opposite effect (note however Szeryng's bowing). More rhythmic interest is generated by simply treating these three bars as the closing hemiola they are, and allowing the irregular eighth note pattern to play out against it. Other aspects of the courante are best investigated along with corresponding occurances in the Double. When we consider the various characteristics of the double we find an amplification of Bach's compositional process for the courante. 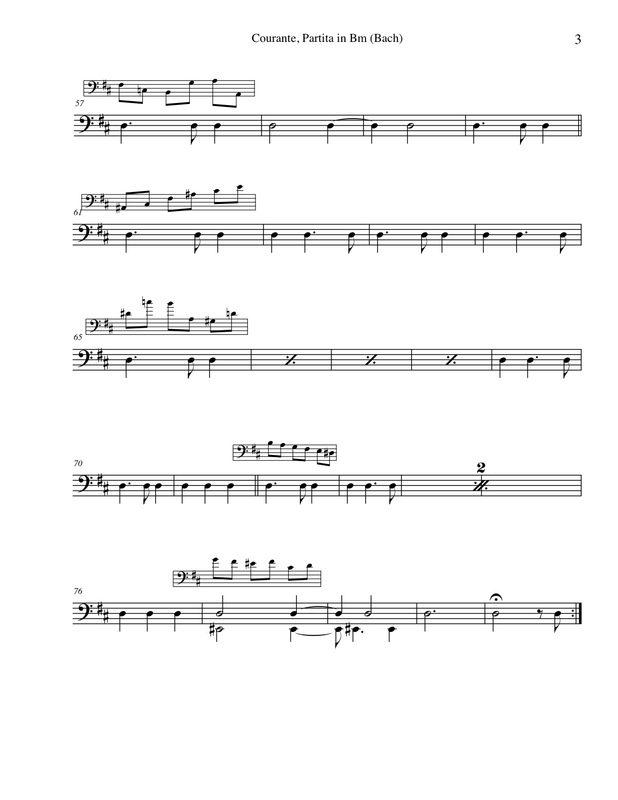 Not only is the bass line and harmony almost identical to that of the earlier movement, but we also find he preserved chord voicings from one movement to the next, along with corresponding musical and emotional characteristics. Our interpretation of the double may then be linked to that of the courante. Dolmetsch, Arnold: The interpretation of the music of the seventeenth and eighteenth centuries, 1972, University of Washington Press. Guys, I keep reading such blogs on different [url=http://startupweekenddf.com/]startupweekenddf[/url] platforms as well, how dangerous plastic is for our environment, ocean life, our health, in fact for the whole eco-system. Must read this article. It's worth reading. Guys, I keep reading such blogs on different startupweekenddf platforms as well, how dangerous plastic is for our environment, ocean life, our health, in fact for the whole eco-system. Must read this article. It's worth reading. I really sometimes copy your content for completing my [url=http://www.supportbonaire.org/]supportbonaire.org[/url] assignments.This is really good one and want you to keep sharing more. Thanks. I really sometimes copy your content for completing my supportbonaire.org assignments.This is really good one and want you to keep sharing more. Thanks. It looks like a must to attend event for the music lovers with all the shinning music stars. [url=https://papersplanet.com/]papersplanet[/url] Let me know when it will take place again, I would love to attend it. It looks like a must to attend event for the music lovers with all the shinning music stars. papersplanet Let me know when it will take place again, I would love to attend it.